"Sleep with the fishes." You've certainly heard this phrase from "The Godfather" (it's an old Sicilian message). But this different type of "sleep" has nothing to do with the topic of this article which is "Do goldfish sleep?" Well, I can answer that question with a yes and a no. Goldfish have no eyelids so they can't close their eyes like we do when we're asleep. Goldfish do, however, rest certain times throughout the day and most of the night. 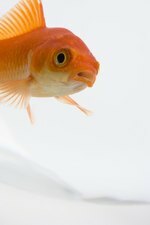 An indication goldfish are sleeping or at rest happens when their bodies tilt a bit with their heads pointing down. They hover slowly with less fin activity than when awake, and they tend to hover near the lower area of the aquarium about an inch or so above the bottom. When "sleeping," Goldfish become less active, moving only slightly in order to keep their stability in the water. Some may mistake this action for an illness, especially if you notice a pallor change. When at rest their coloring may appear pale but don't worry, this is a common occurrence when goldfish are resting. I mentioned earlier Goldfish have no eyelids. When in this state you'll notice their eyes remain open. This also means they are reasonably alert even though they are "asleep." If you make sudden movements near them or turn on the aquarium lights while they are at rest, you may startle them and thus cause them some undo stress. When an animal stresses this can affect their overall health. 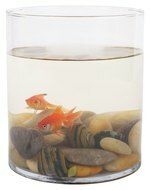 Even a brightly lit room at night could disturb the sleep of your goldfish. Like humans, goldfish sleep better in a dark room. Make sure aquarium lights are switched off for at least twelve hours a day. Goldfish are diurnal, meaning they are most active during the day. Nighttime is not a goldfish's preferred time to rest but they do prefer darkness to light. In a way they follow a sleep pattern similar to our own. If you notice your goldfish swimming upside down or heavily to one side, this is not a new form of rest and your fish is not attempting acrobatics. Do not assume this behavior is normal. This could be the results of swim bladder disease. Swim bladder disease or "flip over" is not really a disease as much as it is a disorder. It's not contagious. It affects aquarium fish and, in some cases, can be remedied within hours depending upon its cause. Sometimes feeding the fish a boiled, de shelled green pea acts as a laxative and will be enough to clear any blockages in the fish. Oftentimes other avenues of treatment are necessary if the cause is bacterial infection, parasitic worms, physical damage or stress. If bacterial, the tank must be cleaned immediately of all bacteria or your entire fish population could be at risk! In summary, fish rest at any time during the day or night but they rest better in a darkened room. Fish have no eyelids (the exception being some sharks) and their sleep is not exactly like the sleep of a human being. And finally, a topsy-turvy fish is a sign that shouldn't be ignored! A clean aquarium is a healthy aquarium.